Being a professional blogger is not the easiest job in the world. With so many bloggers fighting for the same share, making your own blog posts stand out can be quite difficult. However, we all can learn from successful professional bloggers and adopt the tricks of the trade. What is the very first thing that is common to every successful blogger? It is the ability to craft excellent titles. Many bloggers seem to forget the point of the ‘title’. Its goal is to inform readers about the content of the blog post, in a short and concise format. Instead, it is all too common these days to run into blogs where the titles are almost as long as the blog post itself. If you have a lot to say, say it in the blog post, not in the title. The reader should be able to tell what the content of the blog post is just by glancing at the title. If you force the reader to read through a very long title, they will simply move on. Plenty of blog posts offer general information. The title of you blog posts have to offer your viewer something that is of value to them; something that peaks their interest and makes them curious. For example, there are plenty of blog posts that give general tips about losing weight. However, the posts with titles that promote self-interest are usually the ones that get more readers. Nobody wants to know about general weight loss tips. Instead, they want to know about the weight loss techniques that will make look hot and prolong their life. It is a big mistake to think of going bold as sensationalizing. 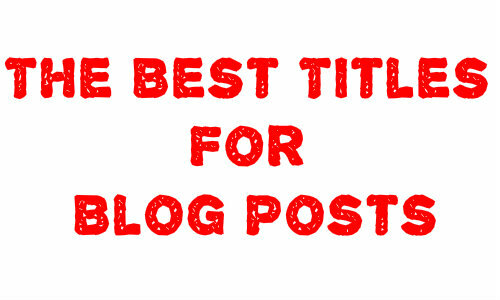 Blog posts with sensational titles usually have content that is pretty poor. However, if the content is of good quality, going bold and out of the ordinary with the title will only do justice to it. Research has shown that people are more likely to click on articles and blogs that a funny or shocking title. Not only is it something that catches the reader’s attention, it also draws them in by offering them something more than any other blog can provide on the same matter. Most bloggers see the title for their blog posts the same way a web designer would see a Meta Name tag – a tool to get better results on search engines. After all, what good is it writing a blog post if readers can’t even find it? However, stuffing the title with keywords is a move that is more likely to backfire than do you any good. Search engines have gotten a lot smarter over the years and they know how to bypass keyword stuffed titles. Rather than showing your blog post high up in the results, search engines might actually end up tagging your blog post as spam. If a blog post titles are good enough, an average quality blog can end up doing a lot better than a blog with solid content, but average titles. This post is authored by Nathan Manning, a professional writer and editor working with the team at 123essay.net. His tips on coming up with great articles has been of great help to students across various fields.